I finally had some sun and a weekend at home to take some pictures. I had 4 garments that were finished and not photographed, including this kirtle and smock. I made the kirtle earlier in the year for a faire I ended up not being able to attend, so I don’t have any pictures of it worn yet. 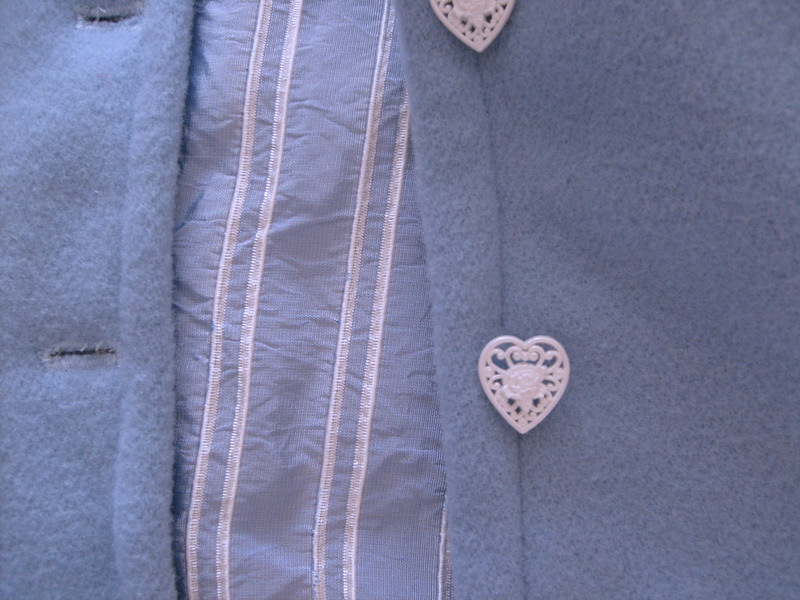 The kirtle is made of a blue worsted wool and lined with a linen-blend, which was also used to make the smock. Both garments are made with patterns from the Tudor Tailor. The kirtle has spiral lacing on both sides. I chose to have the openings on the side to increase the versatility of the kirtle. I can wear it as-is, or with other clothing over it. The back has a rounded neckline. Parts 1 and 2 discuss my construction details. The smock is rather straight-forward, and is really a series of rectangles of varying sizes. Most of the time was spent on the collar and cuffs, so if you wanted a plain one the sewing would go very quickly. 4 meters blue worsted wool: $104.88 from Aliexpress. (I probably could have made this out of 3 meters, but bought 4 to be safe. I still have plenty to make sleeves). 6 yards Kaufman handkerchief linen/cotton: $45.17 with tax from Fabric.com. (I used this for the smock and lining, and have enough left over for a 18th century chemise). 10 yards linen tape: $10.40 including tax from Britex Fabrics. This is a bit more than my usual projects, but wool is not cheap (even though I felt I got a decent deal on the fabric), and I have plenty of materials left over for other projects. 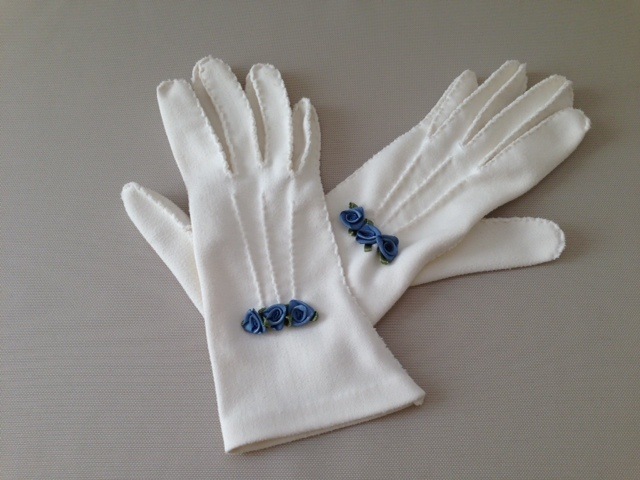 I would like to make a pair of sleeves and a partlet to wear with it. I already own a few other accessories, such as a straw hat, my gorgeous American Duchess Stratfords (affiliate link), and a beautiful blackwork coif commissioned from Romantic Recollections! Posted in Tudor and Elizabethan, Uncategorized and tagged kirtle, sewing, smock, tudor, Tudor Tailor, wool. Bookmark the permalink. Part one, learning from my bodice mistakes, is here. This post is about what I learned while making the skirt the wrong way. After cutting out the skirt panels, which are really just two large rectangles, one for the front and one for the back, I folded the tops over, stitched them, and then folded them over again to enclose all raw edges. (Have you figured out yet what I did wrong?) Then I pleated them and stitched the top of the pleats in place. (Each long edge of each panel was folded in once because it was the selvage). Remember from part one how I realized the worsted wool was too fine for boning, and the reed showed through? Since I had folded the tops of the pleats over twice, the extra bulk showed through on the other side! It wasn’t obvious when the skirt was on a hanger, but once I put it on my stomach pushed the pleats outward, causing a visible line on the outside where I did not want it. I realized at that point that what I should have done was pleat the skirt panels, attach them to the bodice, then finish sewing the bodice lining over the pleats to enclose the raw edges. I should still trim the raw edge with pinking shears to prevent fraying, but now there is not a bulky line that shows when worn! Then when hemming I made the mistake of just folding up the bottom a certain number of inches and stitching without pinning and putting it on before sewing because I was in a hurry and thought I had cut things pretty evenly. Yeah, it wasn’t that even, and wool stretches. So, after my event got rained out and I couldn’t go, I put the kirtle on and had some friends help me look it over so I could re-hem it evenly. The kirtle is now done, but I have been waiting for a sunny day to take pictures, since I haven’t had a chance to wear it out. All the pictures in this post were taken indoors, some at night, and you can see it made the wool seem like four different colors! To wear under the kirtle, I made a smock using a pattern from the Tudor Tailor book I bought on Amazon (affiliate link). It is also awaiting proper photos. Meanwhile, here is a teaser picture! Posted in Tudor and Elizabethan, Uncategorized and tagged kirtle, sewing, tudor, Tudor Tailor, wool. Bookmark the permalink. Near the end of the summer I started on a wool Tudor kirtle to wear for a last minute outing to a Faire. I was so busy sewing that I didn’t blog about the process along the way, but took photos so future me wouldn’t have to repeat the sad mistakes of past me. I am using patterns from The Tudor Tailor by Ninya Mikhaila and Jane Malcom-Davies to make the wool kirtle and the linen smock. It’s a great book with clear diagrams and historically accurate patterns. (You will have to know some basic drafting and how to scale things to yourself. I lucked out and am close to the measurements of the person the patterns are based on). I bought my copy of the Tudor Tailor on Amazon (affiliate link). This is the example shown in the book, which is back-lacing. (Mine is side-lacing). 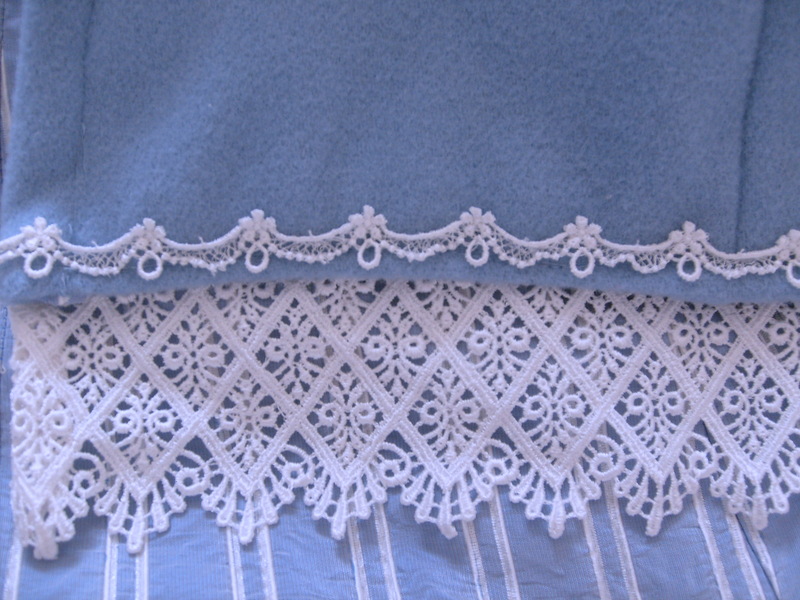 More variations on lacing, the shape of the neckline, and sleeves are in the book. 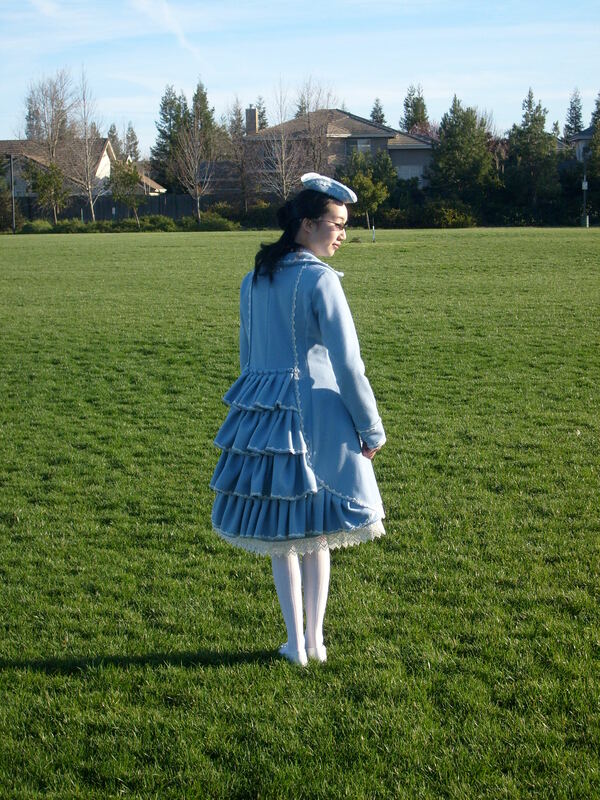 My kirtle bodice is made of a layer of blue worsted wool, a cotton canvas interfacing, and a linen/cotton blend lining. At first I thought it would be a good idea to put in a little bit of reed boning down the front for structure. I was wrong. (Here are the wool and canvas layers before being sewn together). First, boning is not actually needed. Upper class clothing of the era could be highly structured, but the middle class look I am going for has a softer silhouette, and in some period portraits you can see the creases in the front of the bodice. Second, I was using a fine worsted wool, which is not very thick, and you could see the lines of the reed on the outside. I took out the reed and pinned the canvas to the worsted wool, folding the extra fabric of the wool over the canvas. After stitching those together by hand to keep the stitches from showing on the outside of the garment, I put the lining over the canvas and stitched that by hand as well. Before I began I thought, “Hey kirtles have an easy shape, it shouldn’t take too long!” I sadly underestimated the amount of hand-sewing required if you are particular about having your stitches show. Here is the outside when finished. (It looks a little wrinkly on the table, but it’s because it’s not actually flat, and should be slightly curved to fit a human body). The left side is the front, and the right side is the back. I made a slight point in the front bodice, but it can be cut to be curved or straight across. I made this bodice to lace on both sides, so I put eyelets on each edge of the front and back pieces. My usual technique is to use metal eyelets that are then bound with matching thread.This gives me a guide to keep them even. Next up, skirt successes and fails! Posted in Tudor and Elizabethan and tagged costume, kirtle, sewing, tudor, Tudor Tailor, wool. Bookmark the permalink.